The "Star Trek: Axanar" fan film has passed its initial fundraising goal, and its creators hope to secure full funding for the first two episodes. 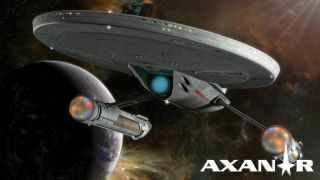 Like Scotty pulling a bit of extra power out of the Enterprise, the "Star Trek: Axanar" fan film has easily warped beyond its initial $250,000 goal and now looking ahead to a new frontier for the sci-fi crowdfunding project. The creators of "Star Trek: Axanar" have their sights set on fully funding the first two "episodes" of the film through crowdfunding alone, which would require a new goal of $660,000. For that, they plan to ask an old "Star Trek" ally to help. "We're trying to get his people, because that's huge," Peters told Space.com. Peters added that he is confident that at least one episode will be funded for $330,000. Each episode costs $250,000; the remaining $80,000 goes to Indiegogo's cut, fan perks and the like. In the coming weeks, he will be meeting with people involved with the project to get ready for filming, which is expected to commence in November. Besides telling the story of Garth of Axanar — a character from an episode of "Star Trek: The Original Series" — Peters says he hopes this film will show another important thing: that it is possible to make a Hollywood-style movie for just a fraction of the budget. The four episodes are expected to cost $1.3 million, a figure that the team arrived upon after speaking with "Star Trek: Voyager" and "Star Trek: Enterprise"assistant director Michael DeMeritt. The initial public projections for production costs under a million were possible, Peters said, but the completed film wouldn't have had the quality required. It's possible to make a film for less than Hollywood does for several reasons, Peters contends. By definition, the film will not make a profit; CBS, which owns the property, allows fans to make their own interpretations as long as they will not gain money from the enterprise. Additionally, actors will receive only a fraction of their normal pay and crewmembers will work for reduced rates, which is allowed by union rules for this kind of special project. Major stars in the film include Richard Hatch, Kate Vernon (both of "Battlestar: Galactica"), Gary Graham ("Star Trek: Enterprise") and Tony Todd ("Candyman," "Chuck," "24"). The film is expected to be released in the spring or summer of 2016.